IOWA CITY — Four years after the University of Iowa Hospitals and Clinics quietly outsourced its AirCare helicopter ambulance service to a for-profit corporation, the public hospital won’t say how much money it’s receiving from the company facing patient complaints about sky-high costs. Walter Brant, 66, of Osceola, filed a complaint with the Iowa Attorney General’s Office against Air Methods for charging him $35,000 for a 40-mile flight to Mercy Medical Center in Des Moines in 2014 — a trip he’s not sure was necessary. “I said next time, let me die, because I’m not paying that,” Brant said. The Gazette investigated the relationship between UIHC and Air Methods because the company now owns and operates the majority of medical helicopters in Iowa. UIHC, with a burn treatment center and a neonatal intensive care unit, receives between 800 and 1,000 helicopter transports a year, providing significant business for Air Methods. The Iowa City hospital is facing a $7 million deficit caused by rising costs, state and federal funding cuts and Affordable Care Act changes. The hospital’s rocky finances make it particularly important the public be able to see whether officials got a good deal when outsourcing a vital state service. But the UIHC blacked out all financial details of the contract. Started in 1979, UI AirCare was the first hospital-based air ambulance in Iowa and one of the first 15 programs in the nation, the hospital reported. Early flights were in a D model A-Star helicopter with room for only two people, according to Mike Dillard, an AirCare nurse for more than 30 years. “Flying alone with the pilot made for some very interesting flights and you haven’t lived until you have done one-person CPR at 5,000 feet!” Dillard wrote in an online history. AirCare added a second helicopter in 1987, moving it to Waterloo a year later. AirCare II now is stationed there at Covenant Medical Center, which is planning a 30-year celebration of the flight service June 24. AirCare III has been based at Mercy Medical Center in Dubuque since 2016. In April 2014, the UIHC signed a five-year, renewable contract with Rocky Mountain Holdings, an Air Methods subsidiary, making it the “preferred provider” for all helicopter transports to UIHC. “It allows UI Hospitals and Clinics to focus on providing high-quality clinical care for critically ill patients, while contracting with an air medical provider with experience and expertise in providing safe and efficient medical transport,” UIHC said in an email to The Gazette. Air Methods, founded in 1982 in Denver, is the nation’s largest air ambulance company serving 41 states, according to the company’s 2016 annual report. The company flew 71,700 patients in 2016, up 14 percent from the previous year, and reported revenue of $1.17 billion, up from $1 billion in 2015. Air Methods provides the helicopters and pilots for all three AirCare sites, according to the contract The Gazette obtained through a public records request. The hospitals supply a registered nurse and a paramedic or other provider for each flight. A UI medical director oversees the clinical care provided on all AirCare flights. Air Methods has “sole authority to bill and collect any and all non-physician service fees” from patients. Those fees and billing policies aren’t outlined in the contract. The payments Air Methods makes to UIHC for clinical care, medical direction and program management were blacked out in the 43-page document, as were payments for medical equipment and supplies. Hospital officials refused to give The Gazette an estimate of how much Air Methods paid the public hospital for each of the last three fiscal years. “At the advice of our counsel, the University is unable to provide the information you requested regarding the amount paid by Air Methods to UIHC since Air Methods’ attorney represented that Air Methods is filing for injunctive relief to enjoin the disclosure of this information that it considers to be trade secret information,” Ann Goff, UI transparency officer, wrote in a May 14 email. The Gazette has filed an application to intervene in these court proceedings to argue for openness. There’s no question air ambulances provide lifesaving services for many patients. A 2014 study in the Canadian Journal of Surgery showed patients with traumatic injuries who were transported by air ambulance often have better outcomes than those who come in ground ambulances because of shorter transport times, more advanced equipment and the presence of a flight nurse and paramedic, Science Daily reported. Stephen and Kristine Vermeulen, of Moline, Ill., believe their 1-year-old son, Asher, might not be alive without the AirCare crew that flew him to Iowa City when he was born 10 weeks early. The couple and their two older sons were on a road trip to Galena in February 2017 when Kristine started bleeding and losing consciousness, she said. She was taken by ground ambulance from Galena to Dubuque, where Asher was born at just under four pounds. Asher stayed in the UI’s NICU for 40 days before going home with his family. The Vermeulens then received a $50,000 bill from Air Methods. “We told them ‘we can’t pay that’,” Stephen Vermeulen said. The couple made numerous calls to their insurer, which paid the bulk of the bill, and Air Methods before negotiating an out-of-pocket payment of $500. Air Methods is facing several lawsuits across the country for alleged price gouging. Michael and Tabitha Cox, of West Virginia, are proposing a class-action lawsuit against Air Methods over $46,000 the company says it is owed for a 76-mile flight for their sick son in 2015, according to Bloomberg. The dispute focuses on the difference between the actual cost of the flight and what Air Methods is charging. "I said next time, let me die, because I’m not paying that." In a federal lawsuit filed in Ohio, Billy Byler claims Air Methods charged him $25,344 for a 36-mile flight, court filings show. He and co-plaintiff Donald Reid, charged $48,000 for a 31-mile flight, allege the company hides its pricing structure and doesn’t work with managed care organizations — so patients have to pay up front and then seek their own reimbursement. Three people have complained to the Iowa Attorney General’s Office since 2015 about air ambulance billing practices. Two complaints concern Air Methods. The first emergency medical technician on the scene couldn’t figure out what was wrong and decided to call an air ambulance, Brant said. The helicopter landed in a field north of his house and air lifted him to Mercy Medical Center in Des Moines. Brant stayed there for two days without being admitted and without a diagnosis, he said. The hospital had to give him scrubs to wear home because EMTs had cut off his clothes. He later saw an ear nose and throat doctor who determined the illness likely was due to an inner ear imbalance or vertigo, Brant said. Brant was shocked when he got the $35,000 bill from Air Methods. Air Methods tries to find financial assistance for every patient, pairing patients with employees who help them “navigate the complexities of their insurance reimbursement,” according to a statement Air Methods sent The Gazette. The company also has a membership program allowing people in about 30 states to pay $40 a year (or $75 for families) for Air Methods to accept as full payment in advance of whatever a person’s health insurance will pay for a medically-necessary helicopter transport. “That could save you thousands of dollars for just a single transport,” the Air Methods website notes. The profit potential for helicopter transports has led to a steady increase in the number of air ambulances, according to the Atlas and Database of Air Medical Services. But 1,049 helicopters nationwide in 2017 are owned by a shrinking number of firms, as for-profit companies have bought out local, hospital-based services. Four operators — including Air Methods — now claim half the industry’s revenue, according to a 2017 article by Consumer Reports. Air Methods’ average charge went from about $13,000 in 2007 to $50,000 in 2016, reported Jon Hanlon of Research 360, an independent research and analysis firm. The real cost of transport averages from $7,000 to $10,000, Consumer Reports noted. Rick Sherlock, president and chief executive of the Association of Air Medical Services, told Consumer Reports air ambulance operators try to collect more from people with private insurance to make up for patients on Medicare or Medicaid, which pay only $200 to $6,000 per transport. Another major player is Med-Trans Corp, owned by Texas-based Air Medical Group Holdings. Med-Trans owns and operates the LifeGuard helicopter at UnityPoint Health-St. Luke’s Hospital, in Cedar Rapids, as well as helicopters at hospitals in Mason City and Sioux City. St. Luke’s LifeGuard averages about 300 flights a year in a coverage area that ranges north to the Mayo Clinic in Rochester, Minn., east to the Quad Cities, west to Marshalltown and south into part of Johnson County. Some patients, including Brant, have questioned whether they needed to be flown by helicopter. A 2015 study by Gary Vercruysse, a trauma surgeon at the University of Arizona Medical Center, showed nearly one-third of air lifts to his hospital over six years weren’t necessary. “Education to physicians calling for transport and identification of alternate means of transportation would be both safe and financially beneficial to our system,” the study notes. Under a Johnson County policy revised in 2016, first responders decide whether to call or cancel a helicopter, said Tom Jones, director of the Johnson County Joint Emergency Communications Center. He’s heard concerns about for-profit companies in other states prematurely launching helicopter transports to make more money. Air Methods said its pilots do respond only when called. “We only act when a first responder or an attending physician determines the patient needs us,” a statement said. 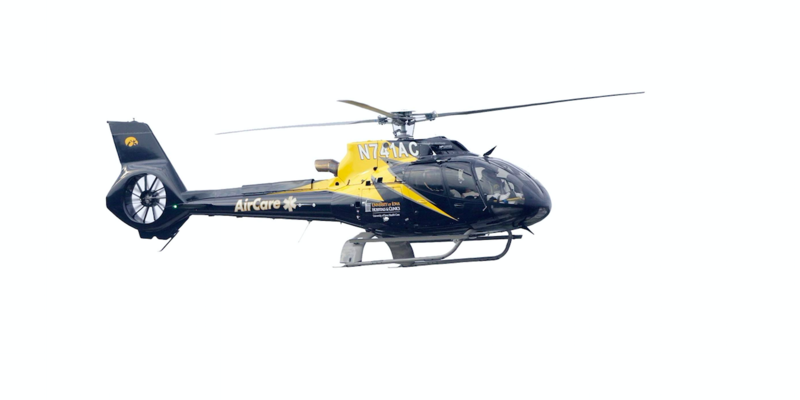 UIHC hasn’t advertised its contract with Air Methods, with many people believing AirCare’s black-and-gold helicopters still are university-owned and operated. “I checked with UIHC and was informed that there were no press releases or Board of Regents reports/presentations that relate to UIHC’s agreement with AirMethods,” reported Goff, the UI transparency officer. The regents govern the hospital. Cathy Glasson, president of the union that represents UI nurses, and a former Democratic gubernatorial candidate, said if the Air Methods contract is saving money, UIHC should be proud to talk about it. “It would be irresponsible for a public entity to not be forthcoming,” she said. Iowa Sen. Pam Jochum, D-Dubuque agreed.